Episode 104: Abe Lincoln Must Die! 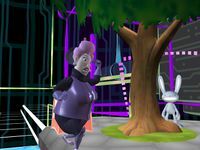 Sam & Max Episode 105: Reality 2.0 finds the sleuthing duo of Sam and Max coping with the obligations of presidential responsibility when the Commissioner informs them of an electron surge that has all the computers in the world on the fritz. 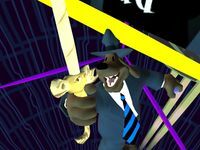 As it happens, one of the largest spikes is right in Sam and Max's neighborhood, so they're the logical choices to take on the case and save the world from online terror. Since there's nothing to take at the office, you can head right outside and start visiting your friends to look for clues. You'll find that the DeSoto is broken, so you'll be confined to the neighborhood for this case. Over at Sybil's you'll find that she's the victim of powerful hypnosis goggles, and she needs you to help break the spell. She won't let you near her, so you'll need to find a projectile. The cannon at Bosco's shoots a non-lethal round; it looks perfect. Note that after shooting you, Jimmy is busy loading another round into the cannon. Use the cannon on Sybil to knock off her glasses. After saving your friend, you'll find out that she was just beta testing the new Reality 2.0 virtual goggles. Reality 2.0 sounds like it may have something to do with your case, so it's best to check it out. Unfortunately, the VR goggles Sybil was using are broken, so you'll have to fix them first. You can get a replacement part for them, and separate goggles for Max, from Sybil's old employer, the COPS. Ask Sybil about the broken goggles and she'll tell you the COPS are located in Lefty's old power tool store, right behind her shop. If you ask the society members why they hypnotized Sybil and follow that line of questioning, you'll get the replacement part for Sybil's goggles and a pair for Max. After using the chip on the goggles, you can access Reality 2.0 at any time by using the goggles in your inventory. To return to the real world, use the icon in the lower right-hand corner of the screen. The first time you visit Reality 2.0, you'll be at Sybil's homepage. You'll find that Reality 2.0 simulates your street, and you can visit the virtual versions of the places in normal reality. The internet will often give you helpful tips explaining how things work as you move through the virtual world. 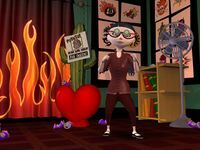 Items you bring into Reality 2.0 will be converted into a virtual equivalent, however, anything you find in Reality 2.0 stays in the virtual world when you leave. 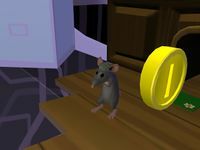 You will need to alter the physics of Reality 2.0 to obtain the coins. You can change different aspects of the world in the Control Room. 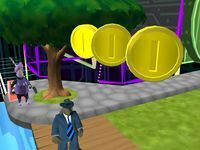 Alter gravity to get the three coins floating in the air. Alter your width to get the coin in the closet. Alter your height to get the coin from Jimmy. Remember that wherever you put on the goggles in the real world is where you start in Reality 2.0. Now that you have some money, you can afford a weapon. The wooden long sword doesn't cut it against the emailbox guard, so you'll need to start looking for better equipment to defeat her. Get prepared for the battle by outfitting yourself with better offensive and defensive gear. You will need at least a +2 weapon to get past Aunti Biotic's +1 armor. There is a +2 sword stuck in the billboard above Sybil's. You will need to grease the sword to pull it out. Defeat a blue slime in Bosco's to obtain some blue slime. Use the wooden long sword to defeat the slime, and use the slime on the +2 sword. Now you just have to do something about Aunti Biotic's powerful attack. You will need a large shield to deflect her initial attack. The jack in the box's pop-up ads would make great shields. Disable pop-ups in the Control Room to get the box. Remember to turn the pop-ups back on before the fight! Once Auntie Biotic has been defeated by using the items you acquired to defend and attack, there is no longer anyone protecting the internet from spreading viruses through its email system. You'll need something devastating to send through the email, and your little computer bug just won't cut it. Luckily, Bosco is selling a deadly biological weapon for one billion dollars in real life. 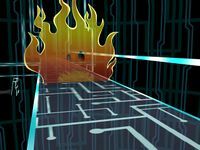 There are a couple problems, however, since he no longer wants to return to reality and he won't give you the password to wire the money into his account. You will need to de-hypnotize Bosco with a blow to the head. Remember that what happens to your avatar in Reality 2.0 affects you in real life. Use the long sword on Bosco in Reality 2.0 to knock him out for real. Tell Bosco to turn around in real life, then use the binoculars on him. 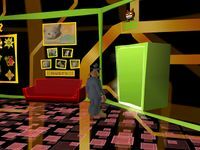 You now have the password to Bosco's account, which will let you wire him the money from Banco Lavadero. In order to do so, however, you'll need to get past the firewall and figure out the bank's money laundering scheme. To get past the firewall on the Reality 2.0 road, you need to paint your car. You can get a paint kit from the Internet Wizard. The colors you need correspond to the letters in your license plate. The first letter is for the front section, the middle for the middle and third for the back. Once you're at the bank, you'll see a matrix of accounts with arrows between them showing the flow of laundering. Press "Cook the numbers" on an account to reverse the arrows adjacent to the account. You can press "Uncook" at the top to start over at any time. When money enters an account, it will attempt to flow through any arrows pointing away to other accounts. If more than one arrow at an account is pointing to a different account, the money will split evenly and distributed to all of them. The goal is to get the entire one billion dollar sum into Bosco's account at the bottom center. 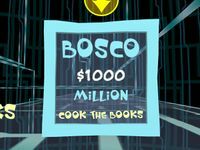 Start out by unlocking Bosco's account when you cook the books there. Cook the top right corner account. Cook the bottom left corner account. Cook the top left corner account. Cook the middle left account. 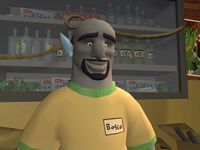 With the money securing in his account, you can now buy the biological weapon from Bosco in the real world, and distribute it throughout the internet at the emailbox Aunti Biotic was guarding in Reality 2.0. The internet is understandably miffed that you infected it with a deadly virus, so it has decided to self-destruct and take you with it. While it loads its destruction sequence, you find yourself in Reality 1.5, a text-based version of your neighborhood street. You start out in front of Sybil's, but due to faults in the net, all the establishments are being destroyed, so you can't enter any buildings. 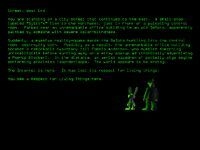 Everything is described to you through text descriptions, although you will be able to hear a small amount of dialogue. Look around, try to pick up what you can and use what you can. Somehow you need to convince the internet that people are worth saving. You need to give the internet Respect for Living Things to save yourself. The monster down below seems hungry. Get Bosco's, dip it in the Lake of Nauseating Cuteness and feed it to the Corporate Presence. Get the Respect for Living Things and use it with the internet. After restoring the internet's respect for living things, it lets Sam, Max and all connected users back into reality. Even though you solved the original case, which was electron power surges, the side effect is that the entire internet is destroyed. As the internet dies, it claims it was only the tool of a mysterious manipulator named Roy G. Biv. Find out who he is and what he's planning in the season finale, Episode 106.